New Jersey Camp Jaycee is a collaborative effort between the New Jersey Jaycees and The Arc of New Jersey, with a mission of providing quality camping experiences to persons with developmental disabilities. Camp Jaycee has been in operation since 1975, and is proud to be accredited by the American Camping Association. 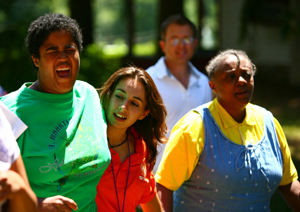 The goals of Camp Jaycee are centered around developing social skills, improving self esteem, increasing confidence, learning in a fun environment, developing physical fitness, and establishing meaningful relationships with new friends. These goals are carried out by a well-trained staff, who are carefully selected to insure the utmost in safety, fun and growth for our campers.